No Frills! Simply boxed & shipped! Our studio in Sheldon, Vermont is filled with Vermont specialty foods, available for creating custom gift baskets for our online and corporate customers. But what about when you simply don't need all the special "gifty" frills and just want the specialty foods boxed and delivered? That's where our NO FRILLS box comes in! You pick the items, we'll make sure they arrive safely. And, if you ever have a question, or something isn't quite right, give us a call (802-868-5400). We'll make it right. Lastly, you need not worry about shipping perishable items. When necessary we use food safe ice packs and thermal barriers, along with expedited delivery. Generally there is NOT an upcharge, but if additional charges do apply in order to ensure that your items arrive safely, we'll contact you for approval before shipping. YOU SAVE MONEY with this selection and delivery option. How? 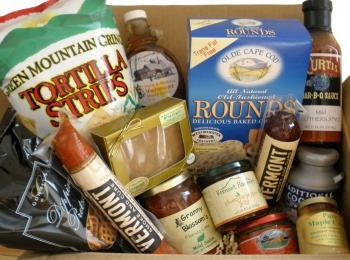 Simply pick the Vermont specialty foods you want, and we box it up and ship it. There's no gift basket, wood crate, or specialty gift box involved. 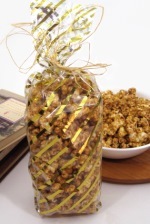 That SAVES you up to $8.00 because there's no Design or Materials fee - no decorative white tissue paper or shredded paper to dress it up, no shrink-wrap, ribbons or bows, no basket design time involved, just great Vermont products boxed and shipped. We only charge $4.95 for packing materials, plus Shipping & Handling. Use the PRODUCTS LINKS and CHECKBOXES below to select the items you'd like boxed and delivered. Once you've selected all the items you want boxed and shipped, enter the number of boxes you want created in the Quantity field, and click the "Add To Cart" button. If you need to make a correction, simply click the "View Cart" link on the left sidebar, then "Modify". You can also "Remove" boxes to start over, or change the Quantity and "Update Cart" at any time. You can add a Gift Message(s) using the field below. If you order more than one specialty foods box by entering a Quantity other than "1" in the Quantity field below, the same gift message will be applied to each box. If you wish to have separate gift messages for each box, and have all the boxes shipped to the same SHIP TO address, simply list the gift messages in an email and send it to us AFTER you place your order, then call us at 802-868-5400 to confirm. All specialty foods boxes will be shipped to the same SHIP TO address entered during CHECKOUT. Currently we are not able to accommodate multiple SHIP TO addresses online, in the same order. To place an order for multiple NO FRILLS Vermont specialty foods boxes, shipping to multiple addresses, with unique gift messages, you'll need to place multiple orders, or give us a call at 802-868-4418 to place your order by phone. 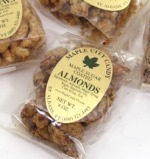 All specialty foods will be securely packed and boxed for safe shipping. Shipping & Handling charges will be applied during CHECKOUT, and as noted above, there is only a small $4.95 charge for packing materials. We simply box and ship!